Shading refers to the process of altering a color based on its angle to lights and its distance from lights to create a photorealistic effect. Shading is performed during the rendering process. This article explains and shows examples of the effects of shading or 3D models. Shading alters the colors of faces in your 3D model based on the angle of the surface to the sun or other light sources. 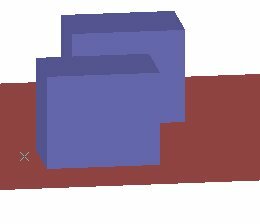 The first image below has the faces of the box rendered, but all in the same color. 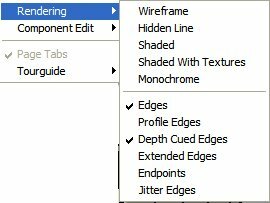 Edge lines have been rendered here as well which makes the image easier to see. The second image is the same model rendered without edge lines. It is difficult to tell where one face of the box ends and the next begins. The third image has shading enabled, which makes the image more realistic and makes it easier to see which face is which. 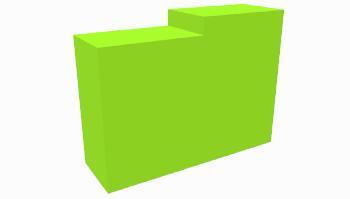 Rendered image of box. This image has no shading of faces, but uses edge lines to seperate the faces. This is the same image with the edge lines removed. This is same model rendered with shading of the faces to alter the colors of the 3 faces based on their angle to the light sources. IRender has an option to highlight the edges of obejcts in the model. Theoretically, two surfaces which are parallel, are illuminated the same amount from a distant light source, such as the sun. Even though one surface is further away, your eye sees more of it in the same space, so the illumination appears the same. Notice in the first image that the color on the front faces of the two boxes is exactly the same. It appears that there is a slight difference where the two faces meet, but this is an optical illusion because of the vertical edge below where the two faces meet. Notice in the second image that the surfaces on the boxes are bright on the front box and darker on the back box. Also the floor goes from light to dark as it gets farther away. This Distance Falloff effect produces images which appear more realistic without having to add additional lights to achieve the same effect. 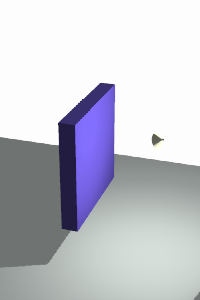 Two boxes rendered with an OpenGL renderer . 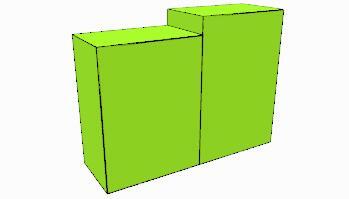 Note that the colors of the two front faces are the same even though one box is further away. The same model rendered using ARRIS CAD which implements "Distance Falloff" to make surfaces which are closer to the eye appear brighter. 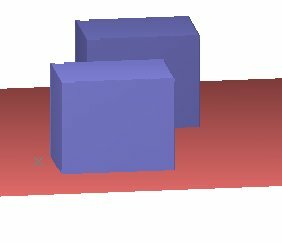 The SketchUp OpenGL interface allows shadows from the sun. However with IRender nXt or ArielVision you can add light bulbs, flood lights and spot lights. The intensity of the light is altered because of the angle of the surface to the light, the distance from the surface to the light, and because of the beam angle of the flood light.